Meshfree radial basis function (RBF) methods are of interest for solving partial differential equations due to attractive convergence properties, flexibility with respect to geometry, and ease of implementation. For global RBF methods, the computational cost grows rapidly with dimension and problem size, so localised approaches, such as partition of unity or stencil based RBF methods, are currently being developed. An RBF partition of unity method (RBF–PUM) approximates functions through a combination of local RBF approximations. The linear systems that arise are locally unstructured, but with a global structure due to the partitioning of the domain. 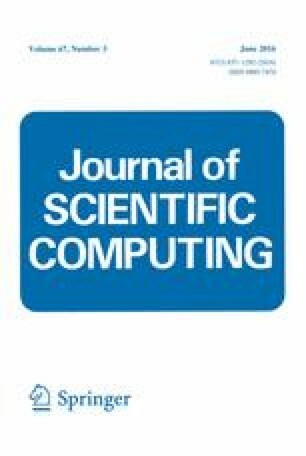 Due to the sparsity of the matrices, for large scale problems, iterative solution methods are needed both for computational reasons and to reduce memory requirements. In this paper we implement and test different algebraic preconditioning strategies based on the structure of the matrix in combination with incomplete factorisations. We compare their performance for different orderings and problem settings and find that a no-fill incomplete factorisation of the central band of the original discretisation matrix provides a robust and efficient preconditioner. Authors are listed in alphabetical order. Heryudono was partially supported by AFOSR grant FA9550-09-1-0208 and by National Science Foundation grant DMS-1318427.